Combine flour, baking powder, cinnamon, salt and nutmeg in medium bowl. Beat eggs in large bowl with electric mixer at high speed until frothy. Gradually beat in granulated sugar. Continue beating at high speed 4 minutes until thick and lemon colored, scraping down side of bowl once. Reduce speed to low; beat in applesauce and butter. Beat in flour mixture until well blended. Divide dough into halves. Place each half on large piece of plastic wrap. Pat each half into 5-inch square; wrap in plastic wrap. Refrigerate 3 hours or until well chilled. Pour oil into large dutch oven. Place deep-fry thermometer in oil. Heat oil over medium heat until thermometer registers 375°F/190°C. Adjust heat as necessary to maintain temperature at 375°F/190°C. Stir together confectioners' sugar, milk and vanilla in small bowl until smooth. Cover; set aside. Roll out 1 dough half to 3/8-inch thickness. Cut dough with floured 3-inch doughnut cutter; repeat with remaining dough. Reserve doughnut holes. Reroll scraps; cut dough again. Place 4 doughnuts and holes in hot oil. Cook 2 minutes or until golden brown, turning often. Remove with slotted spoon; drain on paper towels. Repeat with remaining doughnuts and holes. 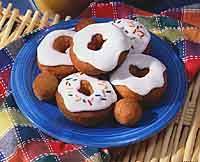 Spread glaze over warm doughnuts; decorate with sprinkles, if desired.